Happy Black History Month – meet some of the characters from Death in the Spotlight! October is Black History Month, when we try to pay special attention to all of the great things that black people have achieved throughout history. It’s a really important thing to do, because often history books don’t do a very good job of mentioning black people, even when they did extremely important things. New books like Vashti Harrison’s Little Leaders are changing that, but it’s great to have time to focus on black people’s achievements. I do a lot of historical research for my books, and what always strikes me is how diverse Britain was in the 1930s. I often hear from people who assume that I am making up characters like Hazel and George – but I’m not at all! There were communities of East Asian people, South Asian people and black people all over the UK, and I’m very proud to reflect that reality in my books. When I was researching theatrical history for Death in the Spotlight, two black men particularly jumped out at me, and I’m very excited to have created characters based on them. I’m going to give you a quick introduction to them both below – I hope you’ll go on to find out more about them! My character Inigo Leontes is based on Ira Aldridge, a Victorian American man who became one of the most famous Shakespearean actors in Britain. He played roles like Othello and King Lear, and as well as the UK he toured all over Europe – he performed in Ireland, Germany and Hungary. I really can’t believe he’s not more well known – he was genuinely one of the biggest stars of his time! Here’s a podcast from the fantastic Stuff You Missed in History Class that describes his life. 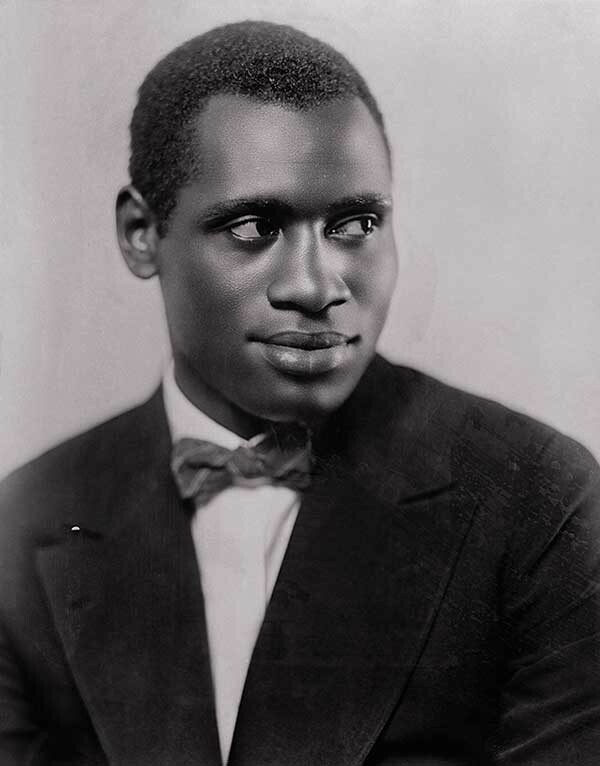 My character Simon Carver is based on Paul Robeson, another black American man who found huge fame in the UK in the early 20th century. He was incredibly smart – he went to Columbia law school and practiced as a lawyer for a while – and then he began singing and acting in the USA. He came over to the UK in the late 1920s, and starred in a lot of hugely popular shows. He became very involved with communism and workers’ rights, as well as the fight against racism (people argue about his legacy because of his links to the Soviet Union) – he was an incredibly powerful advocate for the causes he believed in. I think Rosa Parks and Martin Luther King are two of the most influential black people in history. The fact that they were able to stand up for what they believed in is incredible and inspires hopefully a lot of people! I think Nelson Mandela also is one of the most influential black people in history. Gosh, how could I forget! Absolutely Zaynab! They were wonderful people! I love that I share my birthday with Martin Luther King. I love that you include characters based on people who deserve more creditability and awareness. I also enjoy the LGBT+ themes in your books. Generally if a book is about an LGBT+ romance then that romance is the main plot. If romance is a subplot, you normally just get straight romances. I like how your books are different and ackknowlege many different types of people you wouldn’t normally hear about. Thank you SO much, Izzy, that’s exactly what I was hoping for. I want to write books where some of the characters are queer, and they just get to live their lives and have fun like the straight characters! We did the American Civil Rights movement in GCSE history. I think Emmet Till inspired a lot of change, as he influenced figures like Rosa Park. It is incredibly sad what happened to him though. I think it is brilliant that you include all your different characters in your stories, as they really are not represented enough. I want to do the same if I write books in the future! I can’t wait to read Death in the Spotlight- all your books have such brilliant themes and topics! Emmett Till’s story is so heartbreaking! It makes me sad that tragedies like his happened at all, even though they inspired people to fight harder for change. It’s hard to think that he was the same age when he died as George, Alexander, Hazel and Daisy are in Death in the Spotlight, too – he could have been their friend. If you haven’t, you should definitely read The Hate U Give – it’s a reminder that racism is still a big problem, and it can still cost black people their lives. As many people as possible need to write as diversely as we can, to make sure that people from every background can see themselves in all kinds of stories, happy ones as well as tragedies. I’m glad you’re going to make sure your books do that too! Hi Robin I love your new book! What person do you think uncle felix is based on? Hi Valentina – I think a combination of James Bond and Dorothy Sayers’ detective Lord Peter Wimsey!